The 14" SUN TUNNEL™ is ideal for bathrooms, hallways, laundry rooms, closets, and other smaller areas. Coverage area is up to about 150 sq. ft. The 22" SUN TUNNEL™ is ideal for bedrooms, living rooms, kitchens, and other standard sized living areas. Coverage area is up to about 300 sq. ft. The 10" SUN TUNNEL™ is ideal for bathrooms, hallways, laundry rooms, closets, and other smaller areas. Coverage area is up to about 150 sq. ft. Kit includes dome, shingle/shake roof flashing, tunnel, two adjustable elbows, ceiling ring and diffuser. The 14" SUN TUNNEL™ is ideal for bedrooms, living rooms, kitchens, and other standard sized living areas. Coverage area is up to about 300 sq. ft.
Low profile glass design creates sleek appearance on roof line with thin roofing materials like asphalt shingles. Perfect for developments where local ordinances do not allow acrylic domes on the roof. Package includes flat glass, shingle/shake roof flashing, rigid tunnel, two adjustable elbows, ceiling ring and diffuser. 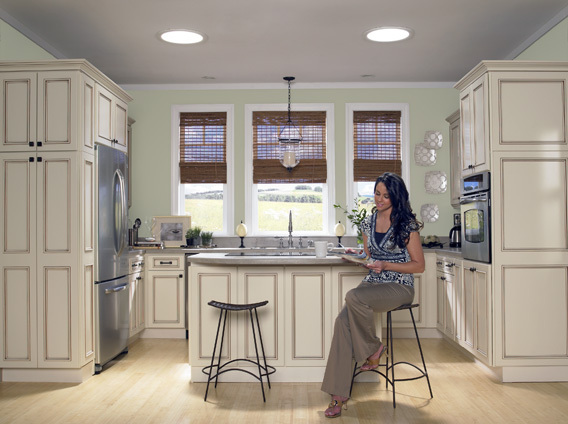 The 14" SUN TUNNEL™ is ideal for bedrooms, living rooms, kitchens, and other standard sized living areas. Coverage area is up to about 150 sq. ft.